Look at the size of that rear wing! Ford makes some pretty sweet for the road, and promises to take the recipe even further. But some of the fastest Mustangs it reserves for the race track – like the GT4 and it's already rolled out, or the new just revealed today. Replacing the discontinued Falcon, the new Mustang Supercar is set to take on Australia's highly competitive touring-car championship, where the Blue Oval has won five drivers' and six manufacturers' tiles since the dawn of the new series at the turn of the millennium. 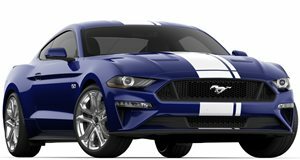 Now revealed in full racing trim, the new Mustang Supercar is the product of joint development between Ford's Australian division, its Asia Pacific design studio, its Performance division in the US, and racing partners Penske and Tickford Racing. It's clearly been designed to closely mirror the shape of the latest road-going pony car, but one look tells you it's been engineered for competition. Just look at the size of that rear wing, for crying out loud, that looks like it could keep a fighter jet grounded at full thrust, or the front splitter that could easily separate us from our own feet. Little was disclosed as to the Mustang Supercar's technical specifications, but it's said to use the same 5.0-liter pushrod V8 that motivated Scott McLaughlin's FG X Falcon to the title last year. Regulations limit output to 650 horsepower – channeled to the rear wheels through a six-speed sequential gearbox – in a vehicle weighing no less than 3,110 pounds. Six examples will be placed in the hands of Tickford Racing, DJR Team Penske (Shell V-Power Racing) and 23Red Racing. They'll face off against no less than 14 Holden Commodores and a quartet of Nissan Altimas. The calendar kicks off in Adelaide next month.